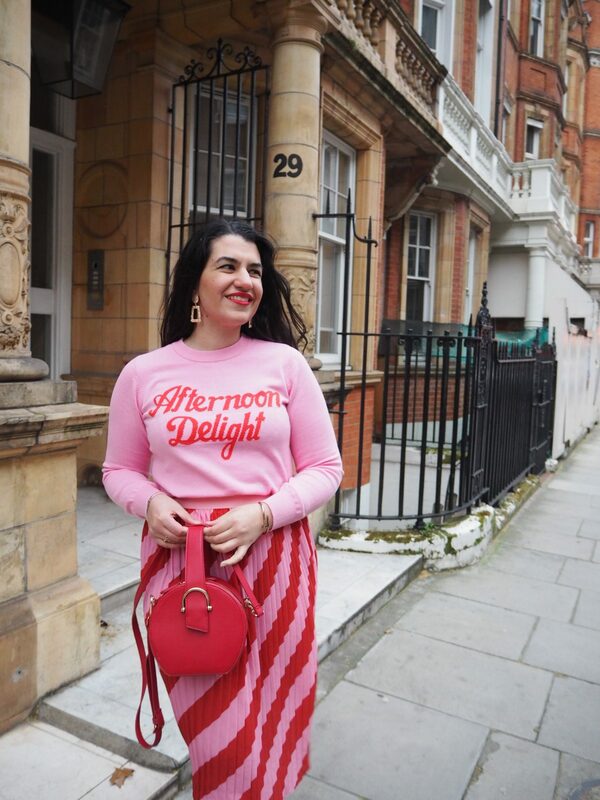 I really, really like it – it might be my favourite outfit of the month. I wasn’t initially going to do a blog post, but I just really liked how these pictures came out. It’s a fine example of how, sometimes, I have some memorable ‘d’oh!‘ moments. Jumper, Joanie (available here). 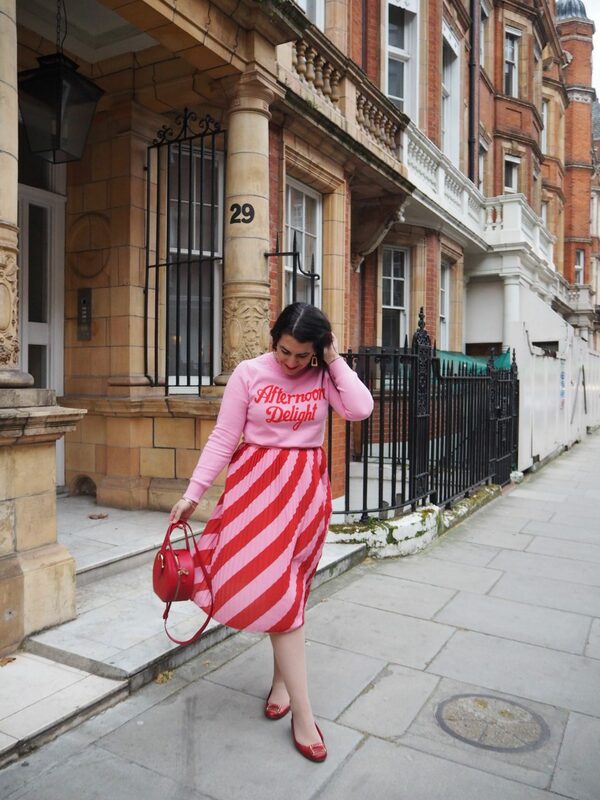 Skirt, Boohoo (available here). Bag, Topshop. Shoes, Marks & Spencer (super old). Earrings, Primark. Ring and bracelet, gifts. Nail bracelet, The Peach Box. 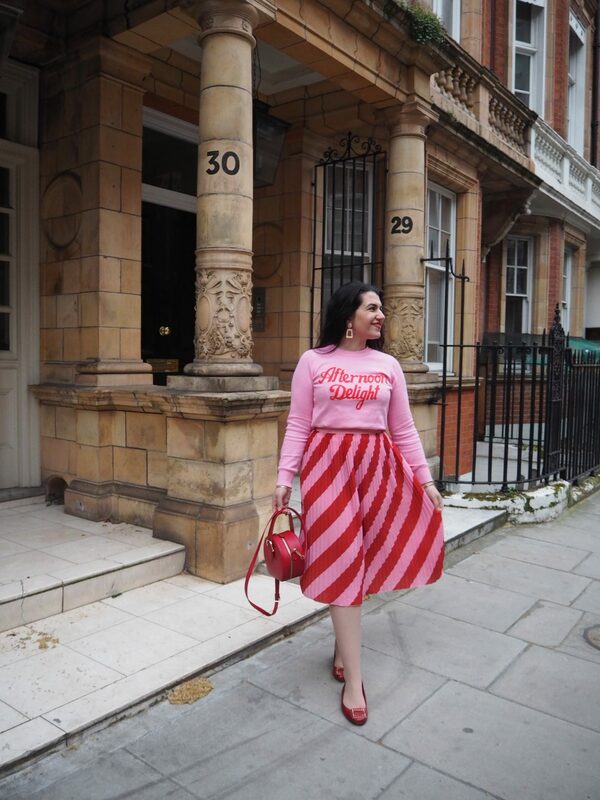 British brand Joanie has become one of my favourite online fashion stores. 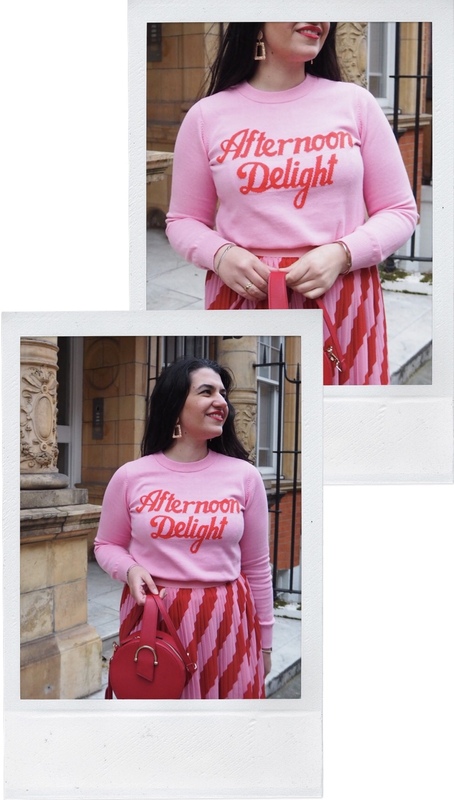 As a lover of vintage-inspired cuts, cuteness and girlie slogans, I am obsessed with almost everything Joanie has on offer, and have to stop myself from spending all of my money there. 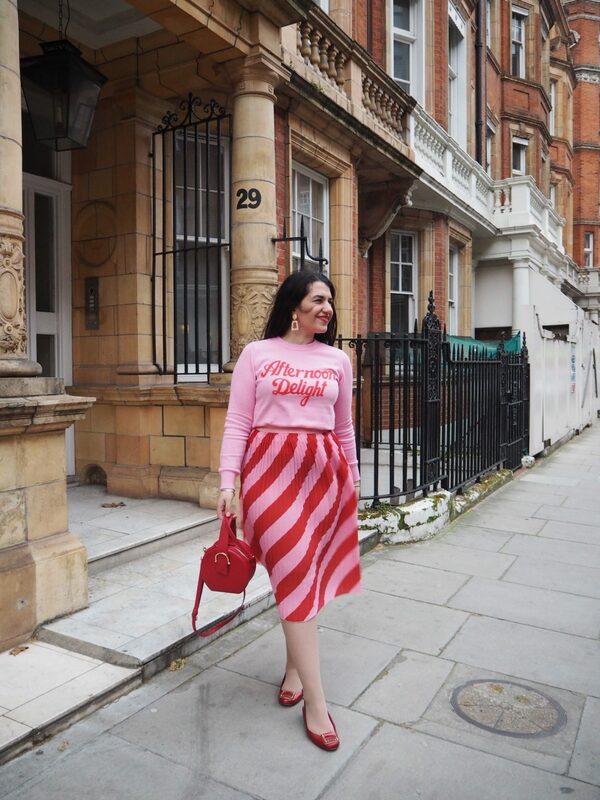 I teamed it with this skirt from Boohoo that I can’t get enough of – I am obsessed. It’s also surprising quite how much use I’m getting out of it. To keep in with the pink and red theme, I used this little bag from Topshop (for some reason I feel like it was made to match the skirt) and these little sling-backs from Marks & Spencer – oldies that recently got salvaged from a big wardrobe cull that looked so damn good with this look but that are, unfortunately, not very comfortable. I’m pretty torn about what to do, because I love how they look, but they kinda hurt – should I say goodbye to them, even though in some ways they still spark a lot of joy? Also, shoutout to these earrings – I’d been kind of wanting a pair like these ever since I spotted a similar pair on blogger Laura Byrnes from Laura’s Little Locket. Primark came out with these and even though I’m trying to shop there less, I just couldn’t resist checking out their jewellery section only to find exactly what I wanted. My mum took these photos of me after we visited Dorothy Circus Gallery – I’m surprised they didn’t come out darker, as it felt like a pretty dreary and miserable afternoon (definitely no delight there). Also, it was pretty windy and chilly – I think storm Gareth was still around. 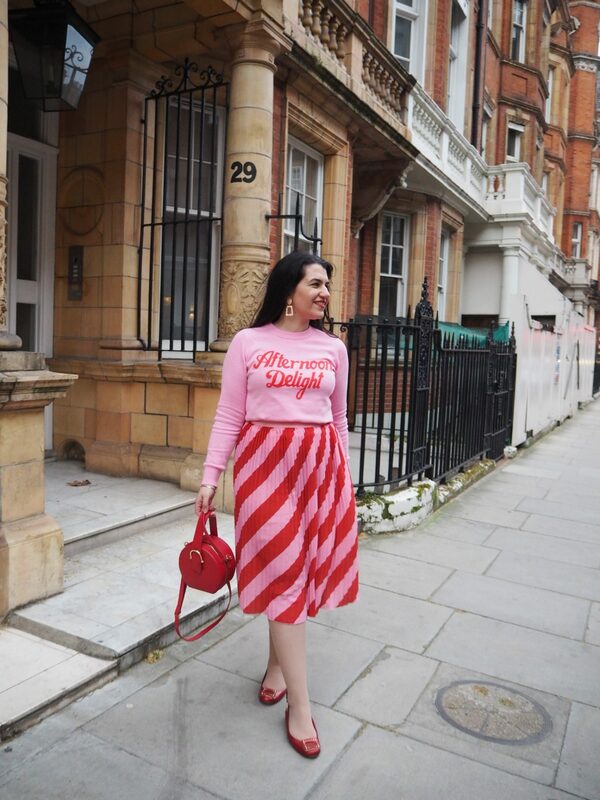 But I have to say, the windiness came in very handy – there is so much potential when you’re taking outfit pictures with a midi skirt in the wind, and I love how airy and floaty my skirt looks! 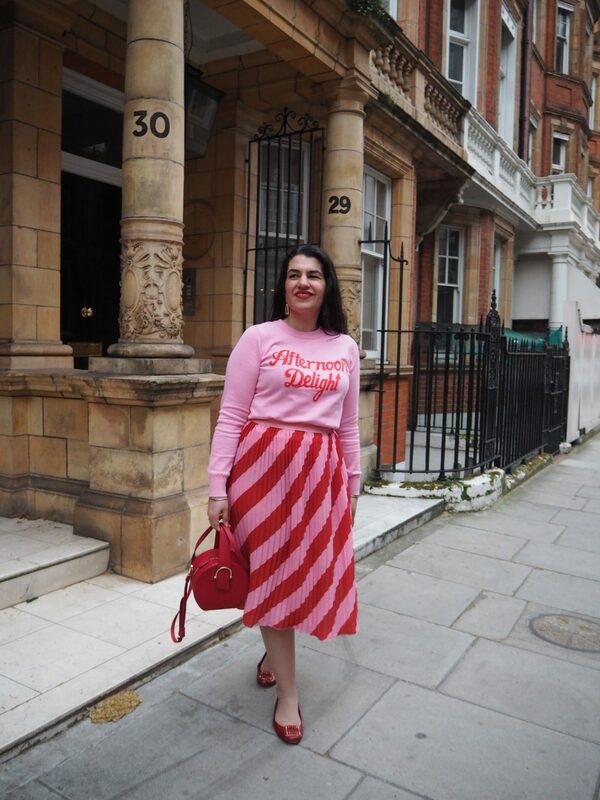 That, together with the jumper, the discovery of a new song and my mum’s patience when taking pictures in the cold, makes this #ootd totally worth sharing on the blog me thinks. 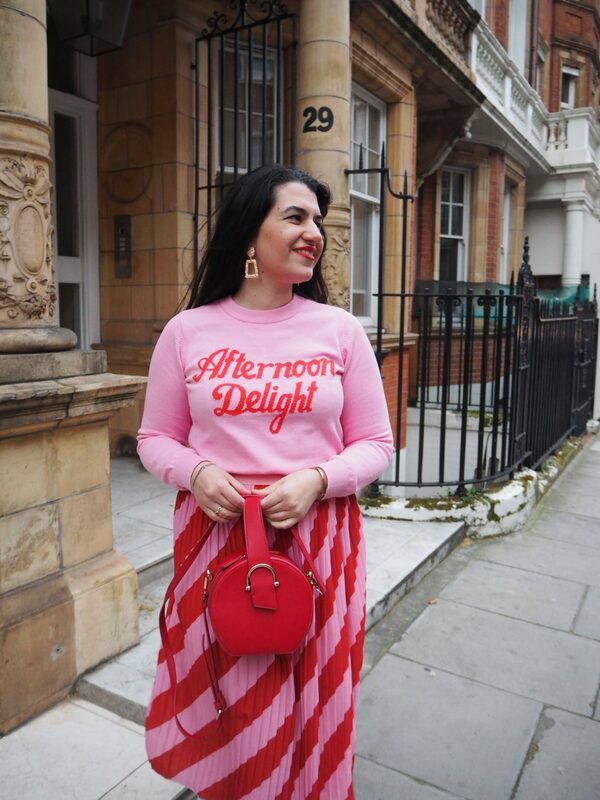 Pictures taken around Marble Arch, London on March 16th, 2019.